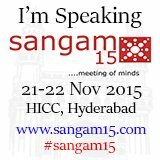 AIOUG Sangam15 : It’s a Wrap! The whole Sangam15 experience is over for me now! Here are the posts I put out during the trip. I did my thank you messages in the Day 2 post, but once again I would like to say a big thank you to AIOUG for inviting me, to the Oracle ACE Program for getting me to the event and to all the attendees for making it a great event and for making my Facebook go nuts! AIOUG Sangam15 : It’s a Wrap! was first posted on November 24, 2015 at 2:59 pm.